WHM stands for Web Host Manager. It is often refered to as a reseller account. 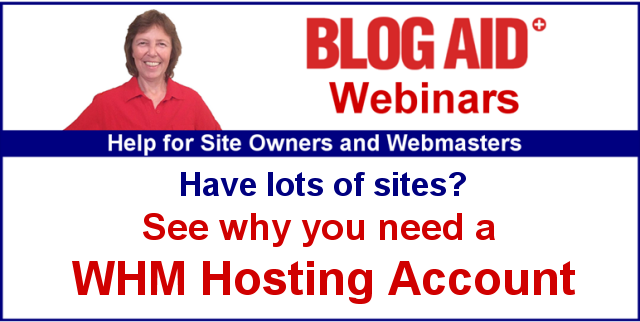 But, you don’t need to resell hosting to take advantage of all WHM bonuses! Think of it as an umbrella account with a console that allows you to easily manage multiple sites. Remember back in the day when hosts advertised unlimited sites and domains? In fact, they stopped cold in 2013 when the massive botnet DDoS attacks started crippling hosts for 10 days at a time. Ever since, hosts have been lowering the resource ceiling on each package and being strict about overages. A WHM Account allows you to place every site in its own cPanel. A wall of protection between each site. Sorry you missed this one!! In the first webinar, we’ll take a tour of a WHM account and all it can do. Folks with multiple sites in one cPanel will see how a WHM account is a must-have for both security and performance. And it’s a great chance for designers to see why WHM is a must for their business. If you’re a designer and you constantly set up add-on or sub-domains just to create a temporary sandbox site for your next design, you’re going to LOVE how easy WHM makes that task. delete the cPanel – fastest way to get rid of a sandbox site!! Plus, we’ll cover exactly how a WHM account protects your own site from those sandboxes so they never put your business site at risk. And, you’ll be able to download the same site creation spreadsheet I use. Trust me, this thing will help keep you sane when running multiple sites, especially temporary ones. The whole point of moving to a WHM account is to get multiple sites into their own cPanels. Great news! WHM has built-in tools to help you do it!! WHM automatically creates the new cPanel and takes care of the add-on domain and folder for you too. This skill will be a super addition to your paid services and help you better secure accounts for clients with multiple sites. All webinar replays will be available for an extended period for Webmaster Training Members (at a minimum until the formal tutorials become available in Level 1). Webinar 1 replay will be available to non-member registrants for 6 days (until Aug 24). Webinars 1 and 2 replays will be available to those who register for Webinar 2 until Aug 31. If you attend live you can ask questions during the webinars. A comment section will be available on the replay pages too. Get in on these discounts during the webinar series! This is training that pays for itself on your very next job that you couldn’t even get before.